The Keeneland Library will open an exhibition of works by prominent Southern California equine photographer Katey Barrett – known for her artistry and documentation – on Monday, Sept. 14. Titled Into the Light: The Art and Inspiration of Katey Barrett, the exhibition will feature approximately 40 works that exemplify Barrett's use of light, film and photographic techniques to produce her unique style of equine art. It will continue through Jan. 29, 2016. “This is the Keeneland Library's first major art exhibition, and I am ecstatic that it showcases the pioneering and inspired work of Katey Barrett,” Keeneland Library Director Becky Ryder said. The Library is open to the public on Mondays through Fridays from 8:30 a.m. to 4:30 p.m. ET. During race meets and sales, it also is open on Saturdays from 9 a.m. to 12:30 p.m. In December 2014, the Library acquired the Barrett collection, material that spans the 1970s to the present and picks up after the Keeneland Library's other photographic collections end. 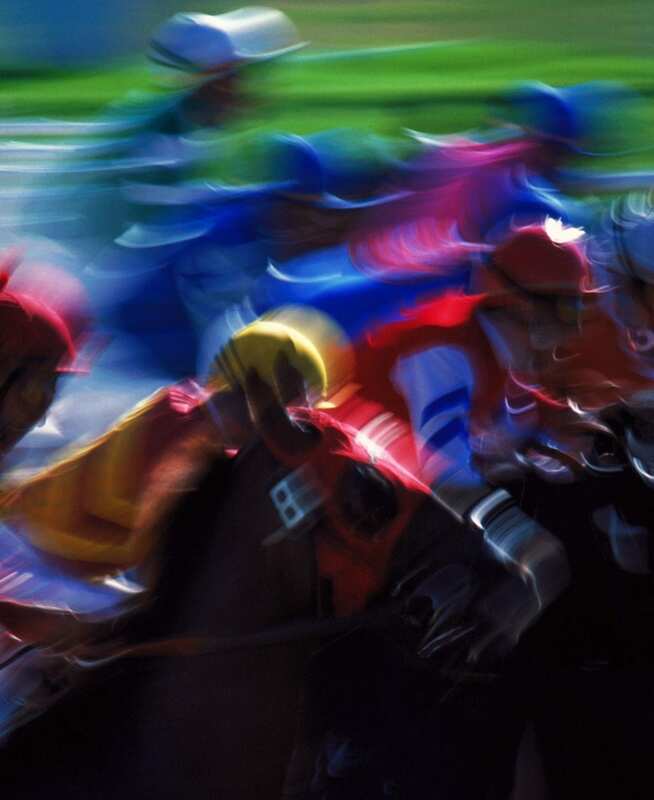 It is the Library's first collection of color photography and its first that comprehensively documents West Coast racing, including runnings of the Breeders' Cup World Championships at Santa Anita and Hollywood Park. Keeneland will host the 2015 Breeders' Cup on Oct. 30-31. While a production assistant on “Mission Impossible,” Barrett wanted to increase her knowledge of camera work and photography, so she purchased an inexpensive 35-mm camera and taught herself the basics. That led to freelance photography jobs from her Hollywood friends, some of whom owned show jumpers. TV producer and racing enthusiast Ed Friendly introduced Barrett to Santa Anita, where she became enamored with the track's unique downhill turf course that grew to be a favorite subject. She became known for her unusual photographs that captured the movement, power and beauty of the horse. Barrett has been the subject of photo essays in such publications as Spur, Equine Images, Western Styles, Daily Racing Form and Thoroughbred Record. She is also the author of The Light Touch (Los Angeles, Pump Publications, 1988), which features an introduction by Eclipse Award-winning author Jay Hovdey. She continues to photograph wild horses for an annual calendar published by the Wild Horse Sanctuary in Lassen Volcanic National Park in California. The Keeneland Library, the world's largest repository of materials on the Thoroughbred, was established in 1939 and serves fans and researchers who value and enjoy Thoroughbred racing and its history. In addition to thousands of books and newspaper and magazine articles, Library holdings include the negative collections of photographers Charles Christian Cook and Bert Morgan; archives of Daily Racing Form; caricatures and cartoons by Pierre Bellocq (“Peb”); and an extensive collection of equine art. Access to the Library's online catalog is available through its website, http://www.keeneland.com/discover/about-library. The Library also lends artifacts to area museums, hosts a lecture series with authors of recently released books and works to expand the collection and its availability to the public. The Library is easily accessed through Gate 1 (Keeneland Blvd.) at Versailles Road and Man o' War Blvd. On Keeneland Blvd., take the first right, which is Entertainment Court, and head toward the Keene Barn & Entertainment Center. The Library is to the left. This entry was posted in People and tagged equine photography, Horse Racing, katey barrett, Keeneland Library, thoroughbred by Press Release. Bookmark the permalink.